"Rama! This enquiry into the Self or `Who am I??' is the fire which burns up the seeds of the evil tree which is the mind." SIVAPRAKASAM Pillai was a student of Philosophy at college. Even as a student the question of "Who am I?" arose in him. Before he could find an answer to the question by himself, he qualified as a graduate and got appointed in the Revenue Department of Arcot district. When he visited Arunachala in 1902 on inspection work, he heard people extol the silent Brahmana Swami on the hill as a pure, realised soul and as one who was also an embodiment of detachment. He visited the Swami expecting that he would be able to solve the question which arose in him while he was a student. imparting the Jnana marga. The Swami had disclosed his Self experience in the form of a theory even so early. Pillai sought the Swami's guidance for his personal benefit but there was no reaction from the latter. But the spark of vairagya [?] got ignited in him. Possibly as a consequence, he resigned his job in 1910. 1. What have I to do to escape the sorrows of the world? 2. Will I be able to marry a girl of my choice? 4. If the marriage were to take place how would I be able to raise the necessary money? 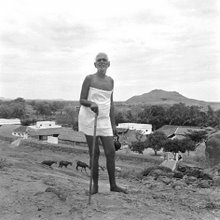 which did not hear or see in spite of having ears and eyes and approached the living Sadguru, Ramana. At Virupaksha cave the Swami had only one occupation, and only one teaching. It was about the atma, experience and enquiry. To such a one what could Pillai submit? In fact, the very life of the Swami was a reply to his questions. He was a bachelor with no thought of marriage, he was poor yet was always happy, if at all he had any desire it was obvious in his teaching. Pillai thought that the Swami taught him to give up desire and follow his example. Pillai gave up all thought of marriage and planned to go home, but before returning he visited the Swami on May 4, 1913 to seek his blessings. There were a number of visitors surrounding the Swami. Pillai sat close to him and was intensely looking at him. In a little while he saw a brilliant light around the Swami, also a boy with a golden body emerged from his head and gradually re-entered him. The scene repeated itself twice at which Pillai was stunned. He could bear it no longer. It became obvious to him that the Swami was capable of bestowing his blessings on devotees. Overcome by emotion, Pillai shed tears of joy and sobbed. He could not utter a single word to express his feelings. The other visitors who did not experience the vision wondered at Pillai's sobbing. After sometime, Pillai became normal and narrated his experience to others. They dismissed the whole thing as a result of his consuming drugs, but Pillai was in a such a state that he did not care to retort. enveloping the Swami with the Swami himself being at the centre of it in the form of the rising sun fully smeared with vibhuti (something which the Swami never did) and drops of nectar coming out of the eyes. Those sitting beside him saw nothing. It did not occur to Pillai to ask the Swami its meaning nor did the Swami bother to explain the vision. Two days later Pillai visited the Swami again. This time the Swami's body appeared as a clear and transparent crystal. Pillai was floating in a space of bliss, and lest he lose that state, he did not move either. Were these miraculous events possible? If so, why were they not visible to the others? Those who saw Pillai could not fail to have noticed that he was not the type of a person who could utter a lie in a matter like that. It was within the experience of those who stayed near Bhagavan that a transformation took place in their mind and that their latent tendencies would change. Of course, Bhagavan's grace also was explicit. Pillai concluded that the visions were a manifestation of the Swami's grace towards him, and he gave up all thought of marriage or worldly desire, and decided to stay back and perform tapas [?] as a celibate. Pillai was a good poet. He wrote a poem entitled Anugraha Ahaval in Tamil narrating the Swami's grace towards him Pillai who lived at his native village near Chengam as a tapasvin left his body on 13 January 1947.